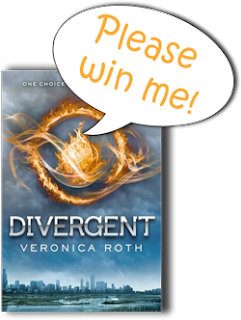 Squeaky Books: Win an ARC of Divergent! Hey squeakers! First off, the winner of the box of ARCs is: Erinberry! And now for some REALLY exciting news! Through some magical circumstances, I ended up with an ARC of the highly-anticipated Divergent by Veronica Roth! However, I already had the chance to read a copy thanks to my blog-buddy Resugo, so I'm going to give this ARC away! Y'all, this book is amazing. Seriously. You WANT to read it. You NEED to read it. For riz. I'm going to make entering simple. You do NOT need to be a follower. However, you DO need to have a US shipping address. And all you need to do is comment on one of my reviews. Easy peasy. Please don't leave a comment that just says "great review!" or something like that. I have over 200 reviews for you to choose from, so I hope you can find one that actually inspires a meaningful comment. (To see reviews organized by title click here, to see them organized by author name click here) After you comment, just fill out the form! Also, please try to keep comments nice. The comment doesn't have to be positive. Just nice. If you disagree with my review, that's fine, and I'd love to hear why! Just keep it clean and kind. Just so there's no confusion, I am giving away a finished copy of Divergent as well, but you can't win that one until may, it wouldn't arrive until mid-May. You could have this one as soon as mid-April! CLICK HERE TO FILL OUT THE FORM AND ENTER! Awesome Giveaway :) Thanks for the opportunity! Thank you for the giveaway! I've been wanting to read Divergent forever. Looking everywhere for a copy! I want to read this!!!!! Really would love to read Divergent now!!! I can't wait!!! Here's hoping I win! Can't wait to read divergent!! !